Constituents raised issues of concern regarding rural road transport, hygiene and environment, food safety, farm produce prices, sand exploitation, medical insurance, gender equality, mass mobilisation, public and bad debts, among others. She took note of a proposal to offer more support to martyr’s mothers living in need in rural areas. She vowed to ask the government to closely monitor sand exploitation. 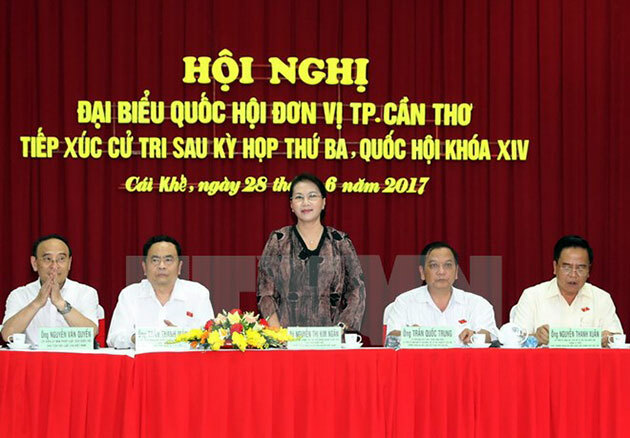 Ngan assured the voters about environmental protection in the Lee & Man paper mill built in the southern province of Hau Giang, saying that relevant agencies have inspected wastewater and production in the mill and released a report assessing its environment impact. At the same time, an automatic exhaust gas monitor system that transmits data from the mill to the provincial Department of Natural Resources and Environment has also been installed. About the collection of empty plant protection drug cans and packs and farming wastes in rural areas, Ngan asked authorities concerned to raise their responsibility and public awareness of environmental protection, partly by guiding farmers how to properly collect empty cans and build biogas pits in farms. Regarding the settlement of bad debts in credit organisations, she said the issue will be addressed in line with the Resolution which will take effect on August 15, 2017. The same day, the top legislator visited and presented gifts to several policy beneficiary families in Can Tho./.